The bowling alley will be renovated for the Centerpoint Community Church’s growing congregation as the owner also moves to sell his alleys in Hallowell and Lewiston. Sparetime Recreation bowling alley owner Andy Couture, left, and the Rev. Craig Riportella of Centerpoint Community Church sit at the Waterville bowling alley. The school will buy the business in January, but will keep the alley operating until April before converting the building for church needs. 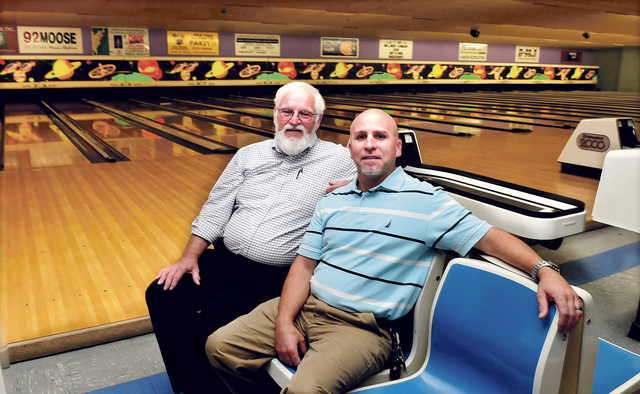 WATERVILLE — Bowling alley owner Andy Couture and church pastor Craig Riportella have found they have a lot in common over the past few weeks. Couture, owner of Sparetime Recreation bowling centers in Waterville, Hallowell and Lewiston, decided that at 66, it was time to sell his businesses and put a “for sale” sign up on his three bowling alleys. Riportella, lead pastor at Centerpoint Community Church a half mile down the road from the alley at 155 West River Road, was looking to expand the church, which has grown rapidly over the last several years. He saw the sign on the bowling alley and stopped in to see Couture. They made an immediate connection, particularly because Riportella had bowled at the alley many times and his church’s Christian bowling league played there. The two men have now entered into a purchase and sale agreement for the 24-lane 10-pin bowling center. The 22,000-plus-square-foot building is on about four acres and the closing date is Jan. 5. Couture, 43, will lease the building to allow patrons to continue to bowl there until the end of April. Riportella plans to gather church volunteers to help Couture do whatever is necessary to clear out the building before the church renovates it into a sanctuary, teen center, child center, cafe and offices for about 40 staff members. But it won’t be the end of 10-pin bowling in Waterville if Couture can help it. Feeling a further obligation to the thousands of people who have bowled at his center over the years, Courture is looking for a site to establish another, smaller bowling alley in Waterville and is putting the word out that he is looking for someone to own it. He said he’s started to talk to the city manager, economic development people and building owners in the city to find a site. The Hathaway Creative Center and former Marden’s commercial warehouse on Water Street were first choices, he said, but he discovered the size of each was not right. He looked at the former Joseph Motor Co. building on upper College Avenue on 29 acres and liked what he saw. He also liked the former L.L. Bean space inside JFK Plaza. Couture, of Jefferson, said he will try to sell the pin-setting machines or move them to a new center in Waterville. He plans to ship the lane panels to his Hallowell and Lewiston centers. The church will keep the bowling center’s kitchen and equipment. Couture plans to liquidate or give away the rest of the items in the building, he said. A former Winslow resident, certified public accountant and former second vice chairman of the Mid-Maine Chamber of Commerce, Couture also was the first general manager of Marden’s Surplus & Salvage. He later built Sparetime Recreation on Whitten Road in Hallowell with two men who originally owned the Waterville bowling center. He has owned the Waterville bowling center for 15 years, the Hallowell center for 20 years and Lewiston for 10 years. Centerpoint Community Church desperately needed to find a larger space, according to Riportella, who is also chaplain of the Waterville police and fire departments and the Kennebec County Sheriff’s Office. The church, which changed its name last year from Calvary Church, had planned to expand on its site at 60 West River Road, where the church’s school, Temple Academy, also is. Riportella, of Sidney, is superintendent of the school. Only 60 students were enrolled in the academy nine years ago when Riportella and his wife, Lisa, now events coordinator at the church, arrived. Now there are 200 students in the school for children in kindergarten through grade 12. The church had 40 parishioners nine years ago and now it has 300. “Because of the growth of the school and church simultaneously, we’ve just exhausted all of our space,” said Riportella, who has five children. The academy, which has been in existence 37 years, will remain where it is on four-plus acres on West River Road, but the sanctuary will move to the bowling center after it is renovated. “Our goal is to be here by next fall,” Riportella said. Many volunteers from the Assemblies of God national fellowship will converge on West River Road next summer to work on the church project, he said. He said Centerpoint does not want to be perceived as the church that shuts down a bowling alley. “We really want this whole transition to be very positive, very smooth, very cordial,” he said. Centerpoint parishioners do a lot of volunteer work in the community. They move guests at the Mid-Maine Homeless Shelter to homes and apartments, and the church also hosts a free, annual fall festival. The church, which turns 70 next year, also helps people who have been divorced and those who are suffering from addiction. Craig Riportella said he wants the new site to be a place where the whole community can gather, not just church members. Couture said the transition represents a lot of work, but the site will look nice when it is completed. “I’m looking for a new bowling center that is equally as nice,” he added. Couture says he does not want to retire — he’s too young — but he does not want to own three different bowling alleys in three different communities anymore. “I want to be a hospice volunteer at Togus (Veterans Administration),” he said.